This is a weekly series featuring my friends who have met celebrities. Wizard World takes over Madison, Wisconsin from Friday, November 30 through Sunday, December 2. I'll be crossing the northern border to be "On the Beat." Over the next few days, I'll be recalling some of my memories from past Wizard World events. 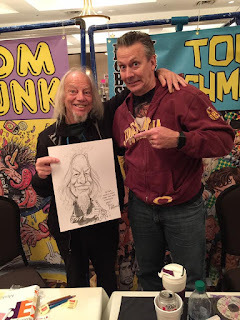 Today, I feature Tom Richmond, one of my favorite artists, in a special Friendly Encounters Wizard World edition. Born in Croatia, Tomas Bunk originally was a painter, but switched to cartooning. Eventually, that led to working on Wacky Packages and Garbage Pail Kids for Topps. In 1990, rhe became a regular cartoonist for Mad magazine. Tom Richmond has been doing cartoons and caricatures since the early 1990's and joined Mad in 2000. He is a 2x Caricaturist of the Year and he has been featured in other comic strips, including Beetle Bailey and Pearls Before Swine. The two legends appeared at Wizard World Dallas in 2016. Richmond presented Bunk with a caricature of him. It was a very cool moment. For fans of Mad magazine, seeing these two together is huge. They are two of the best in the business. Richmond's show of respect with the drawing was awesome and seeing them interact was great. It's nice to see the people we admire, showing admiration for others. Obviously, these two respect and like each other and they aren't too proud or selfish to show their affection. Attendees of these comic cons aren't the only fans, as these two demonstrated. I have met Richmond many times, but unfortunately I haven;t met Bunk. I do have something in common with Bunk though. Richmond did a caricature of the Johngy a few years ago. It's one of the coolest things I have ever gotten from a Wizard World event. Check out TomRichmond.com for more info on this talented artist. Check out WizardWorld.com for all of the info on the many great events they hold across the country. Tomas Bunk and Tom Richmond in Dallas TX-November 2016.